83 • AMBO Nero 2015 Pinot Noir, Pavia IGT 12.5% (Italy) $13.90. 90 • Masseria Supreno 2014 Sangiovese, Puglia IGP 14% (Italy) $14.99. 93 • Masseria Supreno 2015 Primitivo, Salento IGT 14.5% (Italy) $14.99. 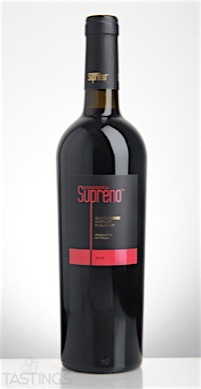 91 • Masseria Supreno 2015 Negroamaro, Salento IGT 14% (Italy) $14.99. 91 • Nuragico 2015 "Justu", Vermentino, Sardegna DOC 13% (Italy) $14.99. 93 • Tenuta Arbeta 2015 Gavi, Gavi DOCG 12.5% (Italy) $19.99. 85 • Torrea del Sale 2015 Pinot Grigio, Pavia IGT 12% (Italy) $9.99. 88 • Torrea del Sale 2015 Sangiovese, Puglia IGP 14% (Italy) $9.99. Sangiovese is Italy's most widely planted grape, found in several regions including Umbria, Abruzzo and Marche, but its spiritual home is Tuscany. 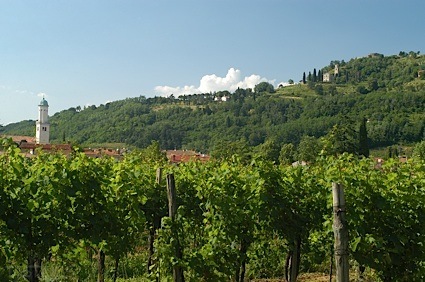 Several famous wines made from Sangiovese are produced in Tuscany, including Chianti, Vino Nobile di Montepulciano and Brunello di Montalcino. A wine made from Sangiovese has appealing red cherry fruit, tart acidity and medium-weight tannins. There are few red wines more pleasant that a young Chianti with its delicious cherry fruit and earthy finish. While s simple Chianti is made for enjoyment from two to five years of age, a wine such as Brunello di Montalcino, 100% Sangiovese, is at the other end of the extreme, as it is a wine that often ages for two decades or more. Sangiovese is also grown with some success in California as well as Australia. Pair wines made from Sangiovese with lighter red meats, duck, poultry and pastas with marinara or Bolognese sauce. Masseria Supreno 2014 Sangiovese, Puglia IGP rating was calculated by tastings.com to be 90 points out of 100 on 10/15/2016. Please note that MSRP may have changed since the date of our review.